There is always a specific dish you have to try in every city in Italy – Pizza Napoletana in Naples, Risotto alla Milanese in Milan, Cicchetti in Venice and what else? You are right, the earthy and heartwarming Pasta Carbonara in Rome! It is hard to go wrong with the beautiful harmony of the ingredients in this pasta. A carbonara sauce contains egg yolk, tart but insanely pleasant Pecorino Romano cheese, guanciale – cured pork jowls/cheeks, some pepper and there you go: Buon appetito! A true Pasta Carbonara is not easy to find but we are here to help! Here are the best 11 places in Rome that you can enjoy your golden color pasta with a smile on your face and warm fuzzies in your belly. Pack your stuff and get ready to taste Pasta Carbonara because it definitely worth a visit to Rome! INSIDR Tip: A true-to-the-roots Carbonara doesn’t contain cream, peas or onion in Rome! Chef Sarah Cicolini really works her magic here! Santo Palato is known as a modern trattoria in San Giovanni area. It focuses on Roman cuisine which is Pasta Carbonara is part of! Along with the pastas, meat and offal based dishes are also big hit here. Even though it is quite new to the neighborhood, trattoria itself is warmly welcomed by the locals and the tourists. If you leave Rome without visiting here, come back again. This place is a favorite among travelers. The most touristic place on the list might be Roscioli but the atmosphere, the menu and the fame of its Carbonara speak for themselves. It is a very popular place so make sure you make a reservation for your visit. It is a family-owned establishment and also famous for its bakery section which is open since 1872. If you want to indulge yourself with the out-of-this-world pastas, this is a place to eat. Taverna Trilussa is a perfect spot for a romantic take away in Rome. Along with the variety of classical Roman dishes, wine is a plus here. They serve you the pasta with big pan and let you eat right from the pan itself! Carbonara is like a royal in the menu here but we are sure that you wouldn’t regret the other pasta dishes as well. Obliviously the cuisine of Rome is incredible. I just couldn't fathom by how much! Da Felice is the description of the virtual feast. Carbonara here is very hard to explain yet very easy to meet your expectations. Layers of crispy guanciale and freshly grounded black pepper on pasta eagerly await you in this place. Da Felice is in Testaccio district right across Trastavere. Both areas are known for local eateries for Roman cuisine however Da Felice shines out with its pasta Carbonara. Looking for a budget friendly restaurant? Check. Local resident approved? Check. Central location yet not very touristic? Check! Taverna Romana is a gem in the middle of Rome. The sign of the restaurant is covered with ivies; it does have this mysterious look from outside. Taverna Romana is a small but a cozy place to spend your dinner. It is a very typical family owned Italian restaurant. You would certainly feel a home like environment while you are slurping your Pasta Carbonara here. Literal meaning of “Grappolo D’Oro” is bunch of gold and it is true that this restaurant is a gold itself. Grappolo D’Oro works with seasonal and locally sourced ingredients. It is a proud Slow Food movement follower. Here you can feel the distinct flavor of carefully chosen ingredients along with the cooking in excellency. The vivid color of Carbonara sauce here might remind you the finest paintings. How imaginary yet so real! If you are looking for a unique dine-out for your pasta, it is this hosteria. Da Cesare may not be your typical fancy restaurant however it is a place that you would not regret coming all the way from central Rome to the outskirts of the city. Why? The pasta in your plate is the answer. Da Cesare is also known for pizza, fried appetizers and seafood dishes so if you have time order these beside your Pasta Carbonara. Enjoy the inexpensive house wine as well – Tip: Ask your waiter because its not on the menu! It’s time to get out of the traditional trattorias and look for different ambient. Emma is a pizzeria in essence but this pizzeria has one of the best Pasta Carbonara in Rome. Two birds with one stone. Another advantage here is that the menu is actually very vegetarian and vegan friendly and as a result you are able to find vegan/vegetarian versions of classical Roman dishes or pizzas. Even though it is not traditional you can taste the best vegetarian Pasta Carbonara here! The place is very popular among tourists and locals, make sure you book a spot. A classical touch to the Roman cuisine with its signature dish Pasta alla Carbonara, Hosteria Romana is a must-visit spot for this dish. Apparently guests do not regret coming here since it is always packed even during lunch time. Hosteria Romana is known for Pasta Carbonara and it well deserves the reputation for it Well they have been cooking this dish since ages so certainly they mastered the best way to make their Carbonara sauce. When you get here you will see that bread baskets and antipasti buffets are ready on the servants. The walls -literally everywhere even the ceiling!- are covered with the colorful notes of the guests on the inside. It is a beautiful combination of traditional and modern. La Tavernaccia is a very special place with its hand written menu that changes frequently. So you have to open your eyes and follow their menu to see when they serve Pasta Carbonara! Every item on the menu is actually a delicacy but their Carbonara sauce is beyond the words. The wine selection is also very rich. It is Roman and Lazio focused cuisine so either way it is sure that you will leave here happy! Pipero is not a regular trattoria or osteria that you would easily find while wandering around busy streets in Rome. It is masterpiece of Alessandro Pipero. A great sommelier and expert of Italian gourmet cuisine. However even though things get fancier, the menu stands for the roots of Roman cuisine. 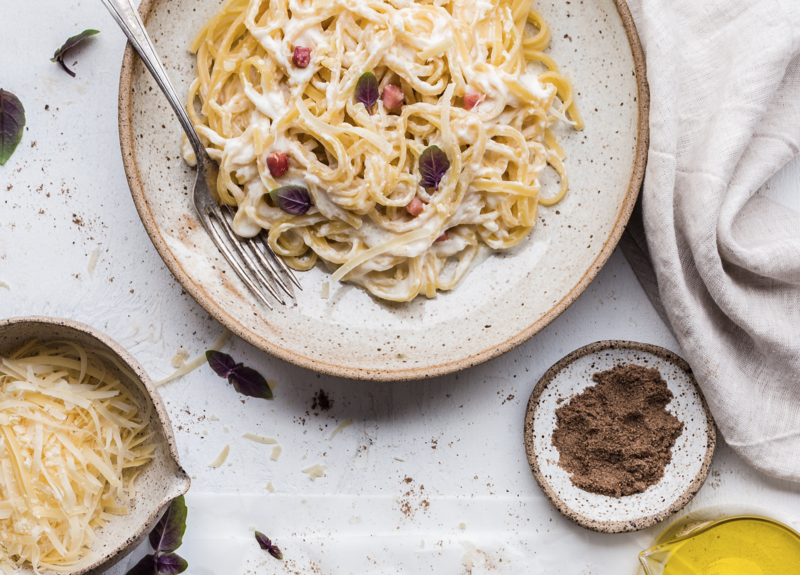 Pasta Carbonara is whole another level here and with one of the best Italian sommelier in the house, you can truly enjoy your pasta with right wine pairing. You can choose the dishes by a la carte option or opt for a multiple course tasting menu. Either alone or as a couple, it is one of the best stops to enjoy both amazing service and Pasta Carbonara. Not to forget: Pipero has one Michelin star and it surely deserves it!